Is Iran Aiding Iraq's Militias? U.S. forces detain suspected Shi'ite militants near Seddah, in southern Iraq. It's just before 3 a.m. in the southern Iraqi town of Seddah, and the Americans are rushing down a darkened street that smells of eucalyptus and gasoline. A moment later the sound of a door crashing in splits the nighttime hush. U.S. troops barrel into a gritty little house in search of militants thought to be responsible for a series of roadside bombings using armor-piercing explosively formed projectiles, or EFPs, which U.S. military officials say come directly from Iran. The soldiers immediately corral the women and children into one room and force three men in the house to lay face down at gunpoint on the floor of another in front of a television glowing blue-green on mute. As other troops begin tossing the place to find any hidden weapons and propaganda, a scene from a late-night newscast flickers. There's Iraqi Prime Minister Nouri al-Maliki, in Tehran that day, smiling and shaking hands with the Iranian President Mahmoud Ahmadinejad as the flashbulbs from cameras silently pop. U.S. military commanders in Baghdad have aired their strongest accusations yet against Tehran's leadership in recent weeks, saying Iranian forces are guilty of nothing less than training, arming and controlling a shadow army of Shi'ite militants in Iraq. U.S. allegations of Iranian arms trafficking and political meddling in Iraq are longstanding. But American assertions about Iran have grown increasingly severe amid overt gestures of friendship between Maliki and Iranian leaders. Lt. Gen. Raymond Odierno, the ground commander for U.S. forces in Iraq, says Shi'ite militia fighters backed by Iran are now killing and maiming more U.S. troops than are Sunni insurgents, who have until now been the most deadly U.S. enemy in Iraq. According to Odierno, 73% of attacks against U.S. troops in Baghdad that left soldiers dead or wounded in July came from Shi'ite guerrillas linked to Iran one way or another. That's nearly double the number from six months ago. Deadly EFPs have killed more than 200 troops in Iraq since May of 2004, the military says. In the eyes of many American commanders, a legion of fighters set loose in Iraq by Iran is now deadlier even than the country's al-Qaeda contingent. Iran, while denying the charge, makes no secret of its interest in shaping events in neighboring Iraq. And few doubt that Tehran offers some support to the country's leading Shi'ite militias, the Mahdi Army of cleric Moqtada al-Sadr and the Badr Brigade. But how deeply is Iran really involved in Iraq's violence? The answer remains elusive, even to U.S. officials who firmly believe the worst. U.S. officials contend that Iraqi recruits from the Mahdi Army have traveled in groups numbering between 20 and 60 to Iran in a training program organized by the Quds Forces that dates back to 2004. Once inside Iran, U.S. officials say, Quds Force handlers transport recruits to training camps near Tehran. It's there, allegedly, that Iraqi militia fighters hone skills needed to effectively use EFPs, mortars and rockets against targets in Iraq. Quds Force trainers, working at times apparently with experienced instructors from the Lebanese militia Hizballah, also school Iraqi guerrillas in intelligence techniques, sniper shooting and kidnapping operations before transporting them back across the border. Once inside Iraq again, militants who've undergone Iranian training reportedly form cells that U.S. officials now refer to as "special groups." These cells, U.S. officials say, then continue to receive weapons, funds and direction from the Quds Force as they unleash some of the bloodiest violence American forces face. "The Quds Force goal was to develop the Iraqi special groups into a network similar to the Lebanese Hizballah," says Brig. Gen. Kevin Bergner, the spokesman for U.S. forces in Iraq. "Special groups would be unable to conduct their terrorist attacks in Iraq without Iranian-supplied weapons and other support." Bergner says U.S. forces have taken more than 20 special groups operatives off the streets of Iraq this year, and a military intelligence officer tells TIME that several of the captured fighters have detailed the training they underwent in Iran during interrogations. The veracity of these claims is unknowable, however, since the Americans have offered no solid proof to support their allegations. Iranian officials have scoffed at the notion publicly. And Ryan Crocker, the U.S. ambassador to Iraq, says emissaries from Tehran he meets keep up the denials behind closed doors as well. No one associated with Iraq's militias is any more revealing. "Sorry, but all these claims are not true," says Falah Shanshal, a parliamentarian loyal to Sadr. "We are not the bad guys as they think." However, both U.S. military officials and Sadr himself say that many fighters from the Mahdi Army have broken ranks and now operate on their own, conducting criminal enterprises and staging guerrilla strikes. No one knows how independent such breakaway factions are. Any string-pulling from afar cannot be detected by U.S. soldiers chasing down suspected EFP shooters and rocketeers armed with Iranian missiles, the surest Quds Force fingerprint in the minds of many in the U.S. military. Staff Sgt. 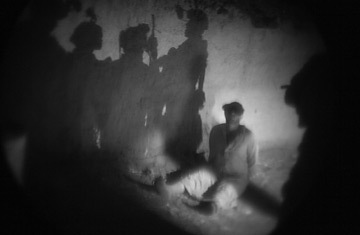 Kenneth Del Valle, a military interrogator who works in southern Iraq, eyes detainees carefully as they are brought to him one by one by other soldiers. Another nighttime raid targeting farmhouses near Seddah has netted five suspected members of a rocket team believed to be responsible for several attacks on a nearby U.S. base. Del Valle's makeshift interrogation chamber is a sweltering side room in one of the houses with a cement floor and grimy walls. Tattered curtains on the barred windows hang limply in the heat, which leaves both Del Valle and his bound subjects sweating heavily as they peer at each other nose to nose in the glow of a flashlight. One after another the detainees speak nervously to Del Valle through a translator he has with him. No one seems to know anything about rockets. There is no mention of Iran or the Quds Force. Nobody has seen anyone from the Mahdi Army, either. Del Valle is sure they are lying. About what he cannot say. "It's too early to tell," says Del Valle, who only gets a chance to put a few questions to each detainee before they are hustled onto a helicopter for further interrogation back at the U.S. base. "I got too many pieces that are missing."